WALKING through the misty mountain top, native trees shade the path leading to the $750,000 first stage of the Mt Archer activation master plan. At the end of the path lies the recently finished Nurim circuit, standing 25 metres outward and 7.5 metres high. With the view of Rockhampton below, the circuit walk is nestled in amongst the gumtrees and luscious greenery on the edge of the mountain. Mt Archer boardwalk: Drone footage of the new Mt Archer boardwalk. Constructed in consultation with the local Darumbal People, Nurim circuit, which translates to "the mountain of raspberries" pays homage to the different indigenous language groups in the area with traditional words cemented in the very beginning of the wooden and steel boardwalk. A move which Councillor Neil Fisher says is a way to acknowledge the past, learn and look to the future. Local councillors and politicians yesterday inspected the area before it opened to the public on Thursday afternoon, just in time for the Easter weekend. 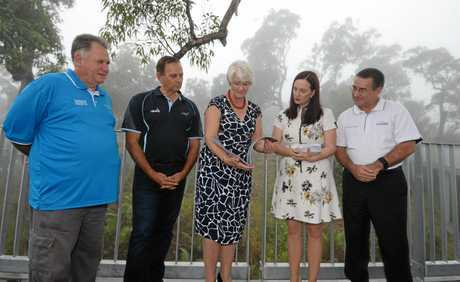 Keppel MP Brittany Lauga said it was a "very proud moment" to see another project completed on Mt Archer thanks to the Palaszczuk Government's commitment of $300,000 from the Works for Queensland program as well as $450,000 from the Department of Environment and Science. "This is a fantastic experience, to be able to see so much of our region among the tree tops of Mount Archer with interpretive signage on our Darumbal culture guiding you along the circuit - this is the perfect place to really appreciate and capture the beauty of our landscape," Mrs Lauga said. As Rockhampton Region mayor Margaret Strelow and Mrs Lauga inspected the area with other councillors, the sound of Bobcats and construction workers in the background served as a reminder more developments were well under way. With plans for an amphitheatre, additional social events and cultural education tours, further stages of the Fraser Park Redevelopment recently received a $1.5 million funding boost from the Federal Government. Cr Strelow said the Mt Archer activation plan would not have been achievable without the strong support from both the State and Federal Governments. "As we tick off many of the projects within our Mount Archer Activation Master Plan, we are beginning to unlock the tourism potential of this beautiful asset in the heart of our region," Cr Strelow said. "This has been a project enthusiastically embraced by all of the councillors and so it is fitting we are here together today."